Welcome to this issue of The Bookkeeper's Notes newsletter focusing on good bookkeeping practices. I would like to wish all my subscribers a happy valentine's day. In this issue I decided to tackle dealing with incomplete documentation in Focus on Bookkeeping and company vehicles in Focus on Payroll. Of course I've also updated news from the CRA and IRS. Under feature products, I introduce you to an Excel Bookkeeping Course which includes hands on, pre-formatted templates with raw data so you can work alongside the instructor. In The Forum, you'll find links to some Unanswered Bookkeeping Questions ... and an announcement of the seasonal closing of the "Ask a Free Bookkeeping Service". This newsletter gives you access to the links of a handful of web pages that are password protected … my newsletter subscribers have exclusive access to these bookkeeping lists and procedures. You will need The Insider's Pass (a password) to access them, which you will find in the last section of the newsletter. Given the size of the site now ... it has over 500 web pages, I seem to be doing more maintenance of web pages to keep the information current than I do creating new content. As a result, I've added a new section to the newsletter called New Pages, Additions and Revisions ... really original eh! You'll find this section at the very end of the newsletter. One of my goals for the website this year is to go out and find products and services that can help you do your bookkeeping. As a result of my searches, some of the new pages are product or service related. If you have found a product or service that helped you with your bookkeeping, I'd love to hear from you. For work from home business owners doing their own books, you may find this service useful … a general review of your ledger. This service is for those who want assurance they are on the right track. I'll perform a high level review of your general ledger to see if there are any obvious problems. You may choose to have me walk you through the problems and how to correct them. If you are interested, send me a message on my contact form. I also work with bookkeepers just getting into the business to answer their questions through phone conferences or online meetings. Feel free to get in touch with me if you are interested in this service which requires purchasing prepaid hour(s) of time (one hour minimum). I apologize that I am behind on creating a Bookkeeper's Directory. Any bookkeeper who contacted me after the last newsletter, please know you all made it in and will receive your complimentary posting as promised. If you would like to be listed in the directory, the price is $25 for one year. If you are a bookkeeper and don't have a website, I will also create a full web page (on my site) featuring your business, if desired, for $75 a year (includes directory listing). You can revise it and update it as often as you want; however each revision to your web page will be $25. As we are approaching the last months of winter, I share with you a picture my neighbour ... neighbor for my American readers :0) ... took of a woodpecker feeding on the suet block she made. Focus on Payroll - Company Vehicle, A Benefit Or A Trap? Click on the logo to see the course curriculum. 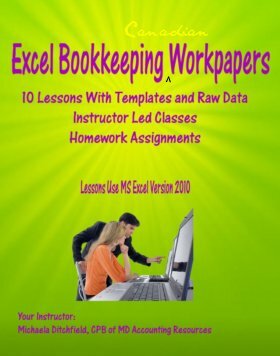 This issue I'd like to introduce you to a "hands-on" course on how to setup Excel bookkeeping workpapers to analyze your business data in 10 easy lessons. Michaela Ditchfield, CPB of MD Accounting Resources leads these classes sponsored by the IPBC. Included with each lesson is a pre-formatted Excel workbook (in MS Excel version 2010) pre-filled with Canadian raw data samples for you to follow and practice "in class" as the instructor walks you through the lesson using raw data. BONUS - Access to the instructor by email for one week following each lesson when you purchase all ten lessons. You can purchase individual lessons or receive a discount by purchasing all 10 lessons as a package. I attended the course last fall, and Michaela's teaching style was professional and easy to follow. I especially liked being able to work in the same spreadsheet she was in so I could solidify the skill / feature being taught. I don't know about you, but it always looks easy when someone else is doing it! I found her examples to be relevant to bookkeeping in Canada. As with all products purchased through Bookkeeping Essentials, I earn a small commission each time YOU purchase a product through the links in this newsletter or throughout the site. It's an extra step that allows me to continue to provide free resources to visitors just like YOU. Click on the picture to see the course curriculum. 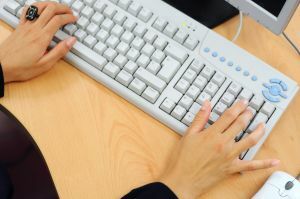 Ask a Free Bookkeeping Question will be closed from March 1 to June 15, 2012. During this period, please use the customized search boxes found throughout the site to see if your question has been asked and answered previously. ... OR if you would like me to personally answer a bookkeeping question for you, my Ask A Private Bookkeeping Question service is still available. My fee is $60 per question. The rate will be rising to $75 per question on June 15th. Until March 1, please take the time to visit ... Unanswered Bookkeeping Questions and share your knowledge. I invite bookkeepers who use this site as a resource to respond to these questions ... or any other posting on this site. As my way of saying thank you to you for giving back to other bookkeepers and small business owners, please "sign" your post with YOUR name and the name and address of YOUR business ... a way to promote your business at no cost. If you could add source references when you respond ... I'd be over the top with delight! Greg from The Small Business Doer, author of the article Banking Assists Business Record Keeping, caught an error of mine in one of the forum postings and took the time to post how he handled the transaction. I really appreciated it because, like many bookkeepers out there, I worry about not recording something correctly ... and I am ALWAYS learning. The reality is I do have a very small practice. I have NEVER gotten 100% in an exam. I am not a certified accountant who is up-to-date with the latest in GAAP and undergoes formal practice reviews. I am not a tax specialist ... but I decided to share my notes on what I've learned with you for free anyway. I'm not trying to denigrate my knowledge, just acknowledge that I can grow and become a better bookkeeper when you share your knowledge too. You need to know, I use these notes for my reference too! Jennifer could use help with GST/HST input tax credits for an MLM business. Perhaps you have an opinion for Tami on How To Record (or Not Record) Direct Selling Transactions. If you live in Alberta, perhaps you will be able to help out Kelsey who is wondering about the benefits of having the business own the vehicle (see the comment section for this posting). Melanie is looking for information on how to switch a set of books from cash basis to accrual basis. For the people who submit their questions through my contact form, you need to answer "Yes" to the question, "May I publish your comments? ", to allow me to respond to your question in the forum ... or you need to purchase a private question. If neither of these options have been utilized, I do apologize but your question will remain unanswered. For people who post a question in the forum without including their email address, you need to know you may miss the response I give in the event I reclassify your post to an existing forum posting with the same or similar topic. Bookkeepers everywhere often have to deal with incomplete documentation ... and wonder how to handle it. Anne Cabrera of Sowing Seeds Accounting Services in Richmond, B.C. contributed an excellent article on her research and experience when encountering lack of "proof of purchase" source documents. Please take time to read her forum posting ... AND please take time to add your audit experience for income tax AND for GST/HST tax. Sharing your experience helps other bookkeepers and business owners alike. For my U.S. visitors, a bookkeeper from Ohio (sorry no name or business name was left to give you details) also made a posting on this topic. I'd be interested in knowing how the IRS deals with incomplete documentation during an audit. Another useful forum post on this topic can be found at AR Reconciliation Mess. It has links to several other posts as well. A quick word about backwork. The above post talks about booking unmatched invoices or payments to the accounts receivable module. While running items through accounts receivable and payables is a great internal control ... when I am doing backwork, if it is clear I have a match between a bill (proof of purchase) and a receipt (proof of payment), or I'm recording regular preauthorized payments, I won't bother running it through accounts payable. I'll book it directly to the appropriate expense account if the purchase and payment are on the same day or in the same month. Why? When possible, I try to keep in mind what I was taught ... I was hired to do bookkeeping for the client, not for me. By this I mean, the client is looking for information on financial reporting to help him/her run the business. Why record two entries for internal control purposes when one will do? Do keep this in mind however, internal controls are really important when a bookkeeper is an employee (as opposed to a freelance bookkeeper) and doing real time entry of the data.